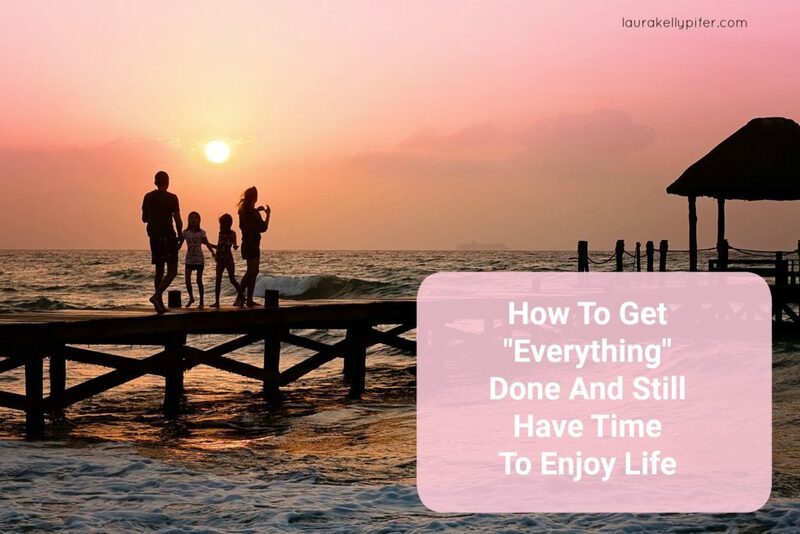 How To Get "Everything" Done And Still Have Time To Enjoy Life - Tips and tools that add value to your world. To give you balance and to make you feel good. You can use these in life, business or both. Have you ever woke up, looking at all the stuff that didn’t get done from the day before? And the day before that? Your To Do list is a mile long and now you have today’s stuff to add to it? Even if you asked your significant other and the kids to pitch in, it still wouldn’t be enough? There’s not enough time in the day to get your to do list done, let alone, enjoy life. I get it. Please know that you are not alone. There are so many other women out there going through the same exact feeling of stress and overwhelm. They are tired and they are frustrated and they simply wish there were a better way. And guess what! There is. Life doesn’t have to be that way. There is a way around this and I’m proof that its possible. Let me share with you what my life looks like at the moment. I own 3 “work from home” businesses as well as work full time outside of the home and commute almost 45 minutes each way, 5 days per week. I have 2 children who who are active, need attention and are in extra curricular activities and still need me to help with homework. I have a husband who deserves my time and attention. I have 4 pets that deserve my time and attention too. I prepare 3 meals a day for myself and dinner 6 days a week for the rest of the family. Sometimes more depending on schedule. I invest in personal development and am currently taking three courses. I am the primary caretaker of the house. My children do have their own sets of chores and my husband does what he can but is away from home a lot during the week. I volunteer for several charities. Why do I share this all with you? Because, even with all of that, there is still time in the day. Sometimes it doesn’t feel like it but there is. I want to share with you how I still get “everything” done and get to enjoy life. Here’s some simple steps to get you started. Prioritize – While my list is long, it could be longer. I’ve decided what is important to me and my family and the things that I choose to be involved in/with are limited. I could totally stretch myself thin by adding in more things but what good is that going to do if I’m not performing my best. Before I commit to anything, I think about how it’s going to affect my life. The truth is that we can do a few things really well, but you can’t do everything. Make the time you have matter. Take out your calendar. Look at all of the activities you’re involved in. Can anything be eliminated, delegated, or automated? For example, if your kids are in sports and you’re always running them to practice, can you find another parent to car pool with? I know for me, when I did this, it saved me an hour each day in just “running” kids. Simplify. Over the past few years, we’ve really cut back on the things we keep and hold on to. I’ve been going through our home and donating what doesn’t fit or serve a purpose anymore. Even papers that used to sit for days on the dinner table are taken care of promptly. Decluttering has been AMAZING! It feels so good to be able to come in and know that there’s less you have to do because you’ve already taken care of things. Some other things…When I’m buying clothes, I look for machine wash to save on time…who wants to iron, right!?! And I make extra at dinner so we have leftovers. I have at least 2 nights during the week that I don’t have to cook but just reheat. WOOT! As far as buying things these days.. We don’t go out and buy like we used to also. It’s more about making memories with each other verses just having cool stuff. If you feel like this is one area that stresses you out, think about how you can simplify things. What would make life easier for you? Is there anything that you can get rid of or cut down on? Are there things that you constantly moving from place to place that someone else might be able to use? Create Standard Systems and Routines. I’ll admit that I am a check list maker by nature and I love a good routine. My day is pretty packed but I know what time and where I need to be and that makes me happy. That wasn’t always the case though and what’s helped free up my time so I can bust through things are little things that I do each day. Here’s some of the routine things I do. Sundays are spent planning our meals, getting groceries and even making meals or prepping meals for the week and going over appointments and things we have to get done. When I know I’m going to be super swamped, I’ll use a meal delivery service, like Blue Apron. I clean the kitchen up while I’m cooking. I make my lunch for the next day from the dinner we’re having. I enlisted the help of my children. For example, after they are done in the bathroom getting ready for the day, they have been asked to wipe down the sink. I take my courses during my lunch hour and I work on them after the kids are in bed as to not interrupt family time. While these little systems are routines are small in nature, they free up a lot of my time. As your doing your daily chores, etc. what is taking up a large part of your day? Can you create a system/routine like I’ve done to free up more of your time?